Image caption Neil Gaiman: "I can write with the radio on"
It's been a TV series, a novel, a stage play and a comic book. 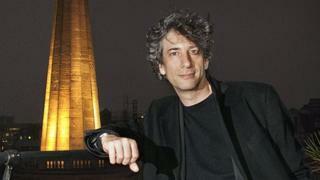 Now Neil Gaiman's dark urban fantasy Neverwhere is making its first journey into the world of radio. "I love radio drama more than I love any other medium," says Neil Gaiman. "There's a specific magic to it. And when it works it's not like anything else." He remembers being captivated as a child listening to Hitchhiker's Guide to the Galaxy on his father's car stereo. "The car was on the driveway, my dad got out and I said: 'Leave it on, I don't want to miss a second of this.'" Now Gaiman is hoping the Radio 4 dramatisation of Neverwhere, which begins on Saturday, might a have a similar effect on a new generation. "Listening to it with an audience in giant stereo was wonderful," says Gaiman, after the official launch of Neverwhere at a central London hotel. "It does feel like there is this huge budget film going on - but in your head." Gaiman, the creator of the Sandman comic series, Coraline, Stardust and The Graveyard Book, wrote Neverwhere as a BBC TV series in 1996. Even he admits there were some aspects of the production that disappointed him. In particular, the appearance of the Great Beast of London which turned out to be, in his words, "a rather sad looking cow". "There was enormous frustration making it for television, partly, I think because we were slightly ahead of our time. The generation of people who would make it are now doing things like Doctor Who - they just weren't around then." So does he think Neverwhere benefits from being on the radio? "What it gains is an infinite budget," says Gaiman. "On this we have a Beast that is Beast-worthy." The six-part radio series, adapted and directed by Dirk Maggs, stars James McAvoy as Richard Mayhew, a city worker plunged into a strange subterranean world after he stops in the street to help an injured girl, Door, played by Natalie Dormer. The bizarre inhabitants of London Below include the Marquis of Carabas (David Harewood), Hunter (Sophie Okonedo), Angel Islington (Benedict Cumberbatch), the Earl of Earl's Court (Christopher Lee) and Old Bailey (Bernard Cribbins). Anthony Head and David Schofield play assassins Mr Croup and Vandemar. The idea for Neverwhere came to Gaiman in the 1990s after comedian Lenny Henry suggested he write a TV series "about tribes of homeless people in London". Fearing he might make homelessness look "really cool", Gaiman turned the idea "three or four twists" to create the fantasy world of London Below. More than 15 years on, he enjoys a "parental relationship" with Neverwhere. "I love it in some ways because it's not quite something I could write now." But the Neverwhere journey isn't over. Gaiman is writing a short story, How the Marquis Got His Coat Back, while a new novel, The Seven Sisters, is also planned. Gaiman's been busy writing for Doctor Who - with a Cyberman adventure set to air during the programme's 50th anniversary year. His latest novel, The Ocean at the End of the Lane, is out in June. In the meantime, he hopes Neverwhere might bring a new, younger audience to speech radio. "I'm definitely heartened by the number of questions that I'm seeing from the UK and around the world on Twitter and on Tumblr and on Facebook... you realise they don't really know radio, but they know Benedict Cumberbatch and Bernard Cribbins and they know Doctor Who and they know me, so that's definitely helping." His own daily engagement with radio is somewhat less fantastical than his fiction: he likes cooking to The Archers, and even admits to writing with the radio on. "When I was working on the [2005 film] MirrorMask with Dave McKean he was completely baffled that I could write with the radio on. He thought I'd need solitude or a little orchestral music. But I'm great with Radio 4 in the background - it's like having a friend wittering away." Neverwhere begins on BBC Radio 4 on Saturday 16 March at 1430 GMT, and continues on BBC 4 Extra from Monday 18-Friday 22 March at 1830 GMT .